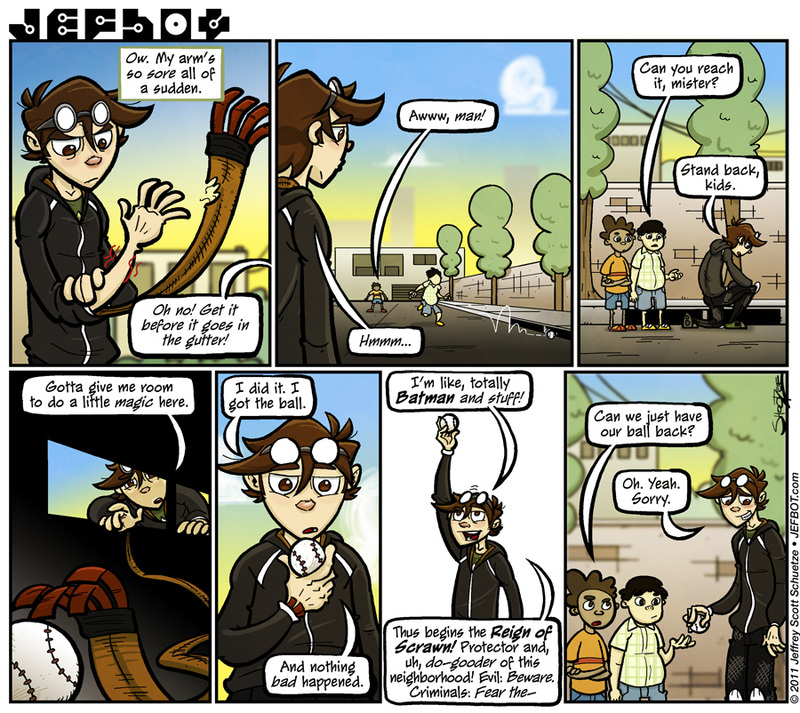 So jefbot finally does a heroic deed with his newfound powers without screwing the job up! (Well, mostly.) Now that he has accomplished at least one of his goals, will he retire for the day and get some much-needed rest or will he venture forth, eager to do more good deeds? Also, many of you readers wondered about the ramifications for jefbot when the Scarf was damaged in the previous strip – well, now we know: bot can feel its pain just as he could feel its thirst, but has he come to realize this, yet? shades of firsting please :D. Happy to see BOTman do something good without any side-effects. Yesterday it was saving kittens, today helping the local kids.. What’s tommorrow I ask. Fighting supervillains, stoping alien invasions? yes, it is nice to see bot triumph every so often, cucumber! heheh. glad you think so, supersonic cucumber! I looked just a moment ago and nothing was here… and Maroš is sitting next to me and he just casualy remarks he firsted. Damn him. And congrats on first. No Bot, You arent like Batman at all. And you should have a look at that ache in your hand. Boys keep away from the wierd man. and yes: bot better wise up to what’s causing that ache in his arm, and see if there’s anything he can do to fix it, pronto. I’m really digging this frequent update schedule and the quality of the work. Just thought you should know it’s appreciated! Loving the evolution of the strip Bot. And thank BADNESS he doesn;t have a nemisis, they would have caught him Monologuing!!!! yay for Top 5, Pixie, and g’mornin’! Oh no. Sure hope he’ll realise why his arm hurts and not do anything -too- dangerous. Being a vigilante is cool and all, but it’s really not hard to damage a scarf and, therefore, himself. very true, Aelyrin: if the Scarf’s his greatest strength, then it could also be his greatest weakness. Well it could still be worse, he could have had a chunk of his on arm missing. Now THAT would be bad. He should still go home and sleep for a day. Two people I have noticed that have been missing from the comments section are Sonitan and Red. Sonitan is hopefully just really busy after recovering and Red’s computer is probably still crap, but one can still worry about others. Good point. I should go tweet Red and see where he is. I don’t think Sonitan uses anything besides e-mail. Any word on her, Jeff? Tell us if you get anything. yep, he could’ve pulled back his sleeve to reveal a big chunk of his arm missing, Fijiman! heheh. but his bond with the Scarf’s a mental one, so he feels the pain, but the damage isn’t transmitted physically. and, agreed: bot needs to get some sleep, asap. haven’t seen Red in a long time, but i seem to remember him having computer problems when last he commented. as for Sonitan, i have no news there, unfortunately. You remember correctly Jeff. His computer had a really bad over heating problem that kept him from using it for long periods of time. Bummer on not hearing from Sonitan. yeah, hoping we hear from her soon. Kids always know how to reck a perfectly awesome Superhero speech! I love the story line! I can’t wait to see what evil you’ll protect the neighborhood from! ah, so true, FunnyShaffer; kids gotta learn their place! let’s hope bot’s wondering the same before he tackles something bigger and badder, Maddgodd81! I got to say… I’m happy for the EXTERIOR backgrounds. I was starting to think that the characters feared the sun or something. I mean, other than the beautiful beach party several arcs before, all the action tends to occur in relatively safe inside environments. So good to see trees and streets and the sort. And other victi– ahem! other people. Yes, people. People is good. Agreed. The exterior backgrounds are great. I especially like the cute little cloud in the second panel. I have been trying to decide if it looks like anything in particular. Perhaps a bit chibbi T-rex-like? as far as a behind-the-scenes video of how the strip’s constructed, that’s definitely on my list of things to do. unfortunately, i’ve been short of time as of late, but maybe once i’m done with my next two conventions, i’ll put something together. He did a good job on the ball retrieval. Perhaps he should quit while he’s ahead – not that I think he will though. I predict it will take a close call or a mighty screw up for him to take off the scarf. your fears proved correct, Shanna! now it remains to be seen how badly bot can be hurt via the mental link he has with the Scarf. and yes – i think he should definitely retire (if only for the day, if nothing else!) while he’s riding high! Really enjoying this story arc. Seems like this would be a good time for Cel — woman of alien-chasing mystery — to return. yeah, i think the lack of sleep and his superhero shenanigans are catching up with him big time, NateNexus. I’ve a voodoo scarf, Xinda used Jefbot’s hair woven in with the yarn and then through some misguided attempt at a dungeon and dragon’s game next to her room, Cornfather, in their misguided youth (or chibi stuff in high school) cursed the scarf and Jefbot into forever being linked through his subconscious Superego and Id. all plausible theories, Bl4ckw0lf! let’s hope bot’s not bound to the Angry Scarf forever, though! yay! thanks for the love, Kendra! Good heavens. It’s going to his head!! y’know, i played through KOTOR (loved it) but never got around to KOTOR II, drakeye, but from what you described, a similar scenario could happen to bot if the Scarf was severely damaged. they definitely have a symbiotic relationship, and bot would do well to not let any more harm come to the Scarf with that in mind. problem is, he doesn’t realize the extent of their relationship… yet. hey, Red! good to see you back here, man! (and thanks to Shanna for getting in touch with you.) sounds like things are busy, which is usually a good thing. i totally understand when life gets in the way of visiting the site, but come by when you can so we know you’re still around. …For some reason, I just want to call him gogglehead. Speaking of which, do you remember Digimon season 3 (assuming you saw it)? Apparently, Gallantmon was originally called Dukemon. And he wore the Hazard symbol on his chest. In other words, he’s a Duke of Hazard. I am not making this up, the Japanese really do love bad puns that only a select group of people would get. and i used to love Digimon! i did watch season 3 but didn’t put together the “Duke of Hazard” pun. the japanese are really familiar enough with that show to put that together!? amazing. Digimon was one of the coolest shows out there, but it started to decline after a while. I know that I watched all of the first two seasons and most of season 3, but very little after that. Or was there more after season 3? So here’s a question—will the scarf repair itself, or will ‘bot have to learn to knit? Because the Cornfather’s possible reactions to the latter already have me snerking. So, I’ve noticed everyone’s assuming Bot can take off the scarf… Can he? Or does the scarf have to let go first? The fact that there’s a Batman reference make this this comic amazing. <3 Bot better start beating up some bad guys!! hard for me to resist a good Batman reference, Nat!